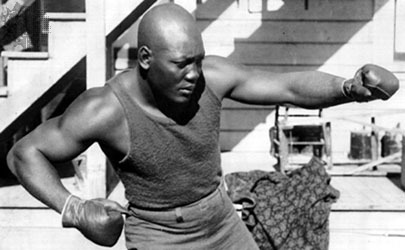 The US Congress has recommended that a presidential pardon should be granted to the first black world heavyweight boxing champion. Jack Johnson won the title in 1908 but was later convicted of transporting white women across US state lines for immoral purposes. Johnson served nearly one year in prison for what is now seen as a racially motivated conviction. Congress stated that Johnson's success motivated other black athletes. His 1908 victory over Tommy Burns prompted the search for a “Great White Hope” who could defeat the black man, but Johnson held the title until 1915. After his conviction in 1913, Johnson fled the US, returning in 1920 to serve his term. He returned to boxing but was unable to regain his title. The congressional resolution urges President George W Bush to grant Johnson a pardon. It states that the conviction was racially motivated, prompted by his sporting success and his relationships with white women. “He was a victim of the times and we need to set the record straight – clear his name – and recognise him for his groundbreaking contribution to the sport of boxing,” said member of the House of Representatives Peter King, the author of the resolution. US authorities had at first tried, unsuccessfully, to prosecute Johnson over his relationship with a white woman whom he later married. A second white woman then testified that Johnson had transported her across state lines in violation of the Mann Act. A similar resolution, sponsored by presidential candidate John McCain, now goes before the Senate for consideration.